The importance of the mind-body connection is evident in the increasingly impactful role that mindfulness and spiritual belief play in helping cancer patients improve their quality of life. And a growing number of cancer patients are turning to alternative approaches that draw on the mind’s ability to moderate the body’s responses to illness. 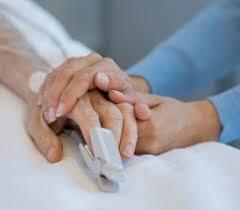 There is a growing body of research, including research done by the International Forgiveness Institute, showing that mind-body approaches in oncological medicine aid the healing process; help patients with advanced cases of the disease cope with their condition and its devastating emotional effects; and help sufferers maintain a happier lifestyle and positive mindset. Self-care strategies and spiritual strength can also help alleviate depression, anxiety and fatigue, and even energize the patient. Cancer patients have to cope with an overwhelming situation dominated by treatments that are often as unpleasant as the disease. Chemotherapy and radiation therapy cause nausea, weakness, hair loss and other side effects that keep the patient feeling sick. 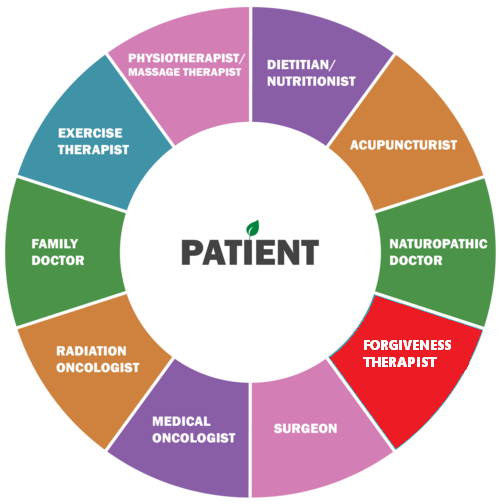 Fortunately, there are many powerfully-effective mind-body strategies that help the cancer patient maintain a healthy and efficacious self-care regimen. Breathing deeply and mindfully helps establish the mind-body connection. It’s a core component of yoga and many forms of meditation. Deep-breathing exercises relax you, lower your heart rate and blood pressure, and enable you to focus on positive thoughts. Try breathing deeply and center on how it makes you feel. If you prefer, listen to calming music during your breathing exercise. You can also combine breathing with some form of physical exercise, such as walking, biking, or yoga. According to the respected health website WebMD.com, if you can bring yourself to forgive, you are likely to enjoy lower blood pressure, a stronger immune system, and a drop in the stress hormones circulating in your blood. Back pain, stomach problems, and headaches may disappear. And you’ll reduce the anger, bitterness, resentment, depression, and other negative emotions that accompany the failure to forgive. While refusing to forgive may not directly cause disease, according to WebMD, the negative impact of holding on to painful memories and past wounds can weaken the immune system and make you more susceptible to illness including cancer. Watch a short video about the amazing power forgiveness has had on one woman’s life and her battle with cancer. “If I hadn’t learned to forgive,” says Jayne Valseca, a cancer patient who was essentially given a death sentence, “I may not even be alive today.” Watch the video here. While not a treatment method per se, the act of forgiving yourself can free you mentally and emotionally so that you may best concentrate on healing. When you get cancer, you may blame yourself for smoking, eating the wrong foods, spending too much time in the sun…the list could go on forever. You question every decision you’ve ever made and punish yourself for the actions you did, or did not do, that might have contributed to your disease. By practicing self-forgiveness, you will gain an inner peace and the freedom to look to the future instead of the past. Meditation is another self-centering exercise in which quiet and inner stillness focus one’s awareness. Meditation can help cancer patients manage nausea, pain and stress, and aid the body’s ability to heal by improving sleep and mood. Mindfulness is key to self-care in cancer patients, and few things help focus one’s energy and inner resources better than meditation. There are many forms of meditation. Some people concentrate on one part of their body, while others focus on a word or phrase as they meditate. Some meditative disciplines focus on controlling pain, while others are designed to help practitioners accept and cope with the physical changes their bodies are going through. The mind’s ability to project images with sensory qualities is another effective means of making the mind-body connection. Mental images can affect your senses, a useful exercise for people suffering the physical discomforts of cancer. Some patients combine their spirituality with meditation by concentrating on religious images. Patients with a strong sense of spirituality often gain a strong sense of well-being, which makes it easier to cope with the disease. It should be noted that spirituality and religion are not interchangeable terms. Some people use religion to channel and focus their spirituality, while other patients consider themselves spiritual, though not religious, at least not in the formal sense of the word. A cancer diagnosis may cause some people to become religious, or to return to a religious practice they may have previously abandoned. Research has shown that spirituality is capable of enhancing the patient’s quality of life through renewed optimism and hope for a future free of the disease. Cancer patients sometimes experience difficulty with prescriptive medications, as these are often used as necessary pain management. Incorporating self-care practices like deep breathing and meditation can help prevent cancer patients from becoming addicted to opioids during their course of treatment. The use of alternative therapies to create the mind-body connection has been proven effective at alleviating pain without an excessive use of prescriptive methods. Cancer ravages the body in many ways. Its effects can also oppress the mind, impeding its ability to help patients deal with the symptoms of the disease. But alternative self-care therapies and spirituality can help marshal the power of the mind to mitigate the pain and physical misery of cancer. You can contact Brad at Brad@selfcaring.info. Forgiveness News, IFI News, Newscancer survival, cancer survival strategies, Cancer Treatment Centers of America, Counseling, Deep breathing, Education, forgive, forgiveness, forgiveness for cancer patients, forgiveness research, forgiveness therapy, Forgiving, image projection, meditation, Self-Forgiveness, Web MD, Wellness, Why Forgive? Previous Article I understand that part of forgiving is to reduce anger. Yet, I am concerned about this. If I deliberately reduce my anger toward the person who hurt me, am I at the same time reducing my motivation to seek justice?